I am installing a new Weil Mclain WM97 Boiler. It is a 70,000 btu model. This boiler comes standard with an internal circulator and expansion tank. The boiler is capable of taking care of three zones without an external pump and expansion tank. My hydronic system has 6 zones each with about 100 foot of 3/4 pex. So I am at the limit of the boiler internal circulator so I am thinking of a grundfos alpha 2 being placed in the supply line pumping toward 6 zone valves. I was planning on installing a separate 4 gal expansion tank on the supply side before the pump so I would be pumping away from the tank. 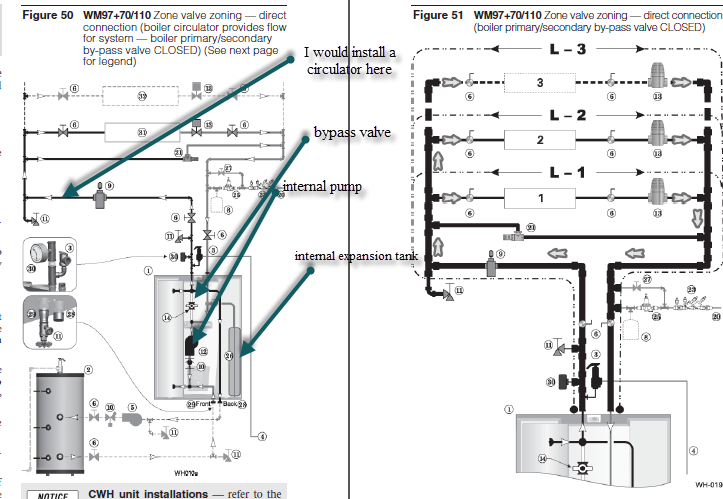 Well I talked to Weil Mclain about this and they think with the wm97 I would be better off closing the internal bypass valve inside the boiler and going ahead a put the grundfos alpha on the supply but move the zone valves to the return side and use the internal 3.5 gal expansion tank and not use any external tank as originally planned. This sounded good to me but the issue now becomes the internal expansion tank is on the return inside the boiler which means I would be pumping toward the expansion tank as it is on the return inside the boiler. I have attached a drawing of my original plan and also a couple pictures from the manual. I am not sure what kind of issues I will have with that internal tank inside the boiler any thoughts?